Clearly one of the most deadly types of crash possible is to be in a car that rear ends the back corner of a parked semi-trailer. Even at slow speeds, like 35 mph, this is often a deadly crash. Federal law requires that all trailers be equipped with underride guards. However, like many federal safety regulations the semi-trailer rules have not been updated in some time, and are not actually designed to protect the driving public. Rather they are apparently a compromise with the trucking industry to provide the appearance of some protection. The Insurance Institute For Highway Safety (IIHS) tested the underride protection systems used on the most popular models of tractor-trailers and found that only one new system of all those tested worked to protect drivers in all three types of rear-end strikes by cars on trailers. This type of crash can happen to any driver. Tractor-trailers pull over at the side of the road for a variety of reasons and are also frequently found in rest area parking lots and large shopping parking lots overnighting. On the highway, in slippery conditions it is easy to see how by riding in the right lane, say when one is about to take an upcoming exit, if a larger vehicle hit one’s car from the back corner one’s vehicle could easily be pushed into the breakdown lane a couple of feet. That is all it would take to find oneself in a rear end collision with a trailer parked there. Fog, ice, and heavy snow and other conditions can also create a condition where it is both slippery and hard to see far enough ahead to avoid sliding just a few feet to the right and striking a trailer. This is a well-known risk and to prevent a car from going underneath, all trailers have a structure made to keep the car out from under the back. However, they are designed to work only at low speeds, not highway speeds. Furthermore, the classic design does not prevent the most likely crash. That is, one in which only part of the front of the car strikes the trailer. A simple change makes the protection system much safer. Moving the support bars towards the outer ends of the trailer makes a very big difference and adds no cost to the design. When IIHS tested this design it was able to prevent a car travelling 35 miles per hour from underriding the back of the trailer enough to prevent a fatal injury to the car’s occupant. Based on its independent study, the IIHS has petitioned the National Highway Traffic Safety Administration (NHTSA) to make the better design the requirement going forward. It has also included asking the NHTSA to make the standard apply to other large trucks such as dump trucks and garbage trucks, which currently are not required to comply with the standards. David Zuby, the IIHS's chief research officer, commented saying “"If trailer manufacturers can make guards that do a better job of protecting passenger vehicle occupants while also promising lower repair costs for their customers, that's a win-win. While we're counting on NHTSA to come up with a more effective regulation, we hope that in the meantime trailer buyers take note of our findings and insist on stronger guards." Another way that drivers can avoid the problem to some degree is to not buy a sedan. The IIHS in a press release said “All the improvements in occupant protection that have helped drive down crash deaths in recent decades count for little when the front of a passenger vehicle ends up under a truck. When this happens, the top of the occupant compartment gets crushed because the structures designed to absorb the energy of a crash are bypassed.” However, as this author once observed first hand when he witnessed the results of a crash of an Acura MDX medium size crossover, the higher the vehicle the more likely that some of the vehicle will contact the trailer itself offering some protection. 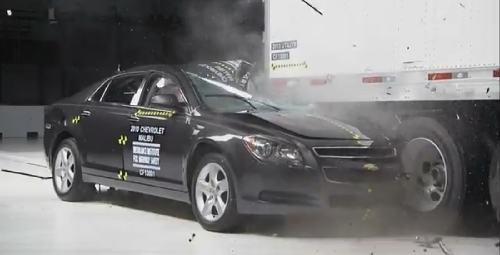 Sedans are low enough to make it completely under the trailer and the trailer body can actually contact the occupants heads as is shown in the video below of a Chevy Malibu, a Top Safety Pick. There is some good news. The Canadian government has required more realistic protection on semi-trailers since 2007 and manufacturers have started to make better products of their own accord. Still, in 2011, the last year studied, 2,241 passenger vehicle occupants were killed when the vehicle they were riding in struck the back of a tractor trailer. That is more deaths than have been attributed to distracted driving due to cell phone usage. Less than 10% of the approximately 32,000 people killed each year in cars are killed in any type of distracted driving accident and that rate is declining. Yet, it receives the most attention. Hopefully the IIHS study will spur some action by NHTSA on an easy to improve area of driver safety rather than continue to focus on the areas that make the best local news stories. Of course some rear-endings of trailers are caused by drivers on cell phones. However, there is a Darwinian solution to that issue.